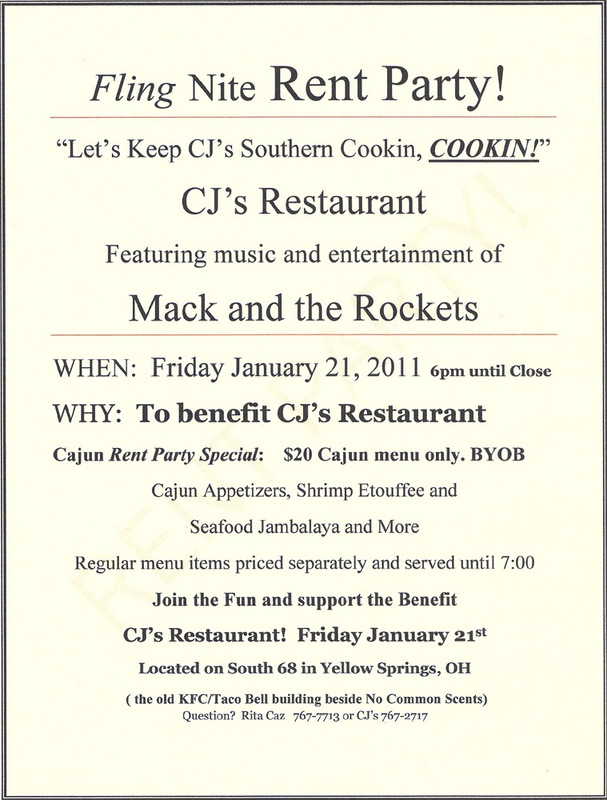 December was a rough month at CJ's and we were seriously considering closing at the end of the month. But some of our customers didn't want us to go and stepped into the breach to help us out. Thanks to two of our customers, we have a full page color add in the Beavercreek and Centerville shoppers. Another group of customers came up with the idea of the Rent Party. Rent parties originated in Harlem in the 1930's. People would provide food and entertainment to their neighbors to raise rent money. With this kind of support from good customers, we felt encouraged enough to move forward. If you share our optimism for the future of CJ's and like our product, and look forward to the new items Carl has planned for Spring, WE NEED YOU! If you can attend the Rent Party, we would really welcome your participation. If you can not attend, we would appreciate a donation. But just as importantly, we need our customers in the restaurant this week more than ever. If we can pack the restaurant with our happy customers all this week, we will be there to serve you in the future. 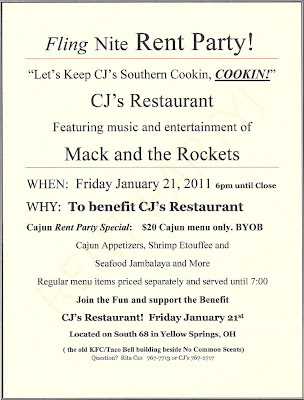 Hope to see you at CJ's!!!! CJ's has really great home-cooked style meals, including delicious cornmeal crusted catfish or cod, beautiful fresh coleslaw in a very light sauce, and wonderful real, not instant, mashed potatoes. For really healthy and tasty comfort food, prepared just the way mom would have made it, go to CJ's. Great prices too, and carry out! We love the sweet potato pie and the pulled pork. I once went in with hungry grandchildren in the middle of the afternoon. There was warm apple pie sitting on the counter just waiting for us! The servings are always generous enough to take some home and Jim and Carl are attentive and happy to please!